KTM Simpang Ampat Railway Station (Stesen Keretapi Simpang Ampat) is a small railway station located in the state of Penang and is served by regular Komuter Trains (commuter) on the Padang Rengas - Bukit Mertajam - Butterworth Komuter Utara Route. Long distance ETS services currently do not stop here, so if you want to travel by the new fast Electric Train Service, you will first have to take a short trip on the KTM Komuter to the nearby larger station of Parit Bunter. Regular commuter services from Padang Rengas in Perak state to the south, travel up and down to Bukit Mertajam in Penang State, all stopping at Simpang Ampat. Nibong Tebal, Parit Buntar, Bagan Serai, Kamunting, Taiping and Padang Rengas. Heading northwest, the route then goes to Bukit Mertajam where most trains terminate on this route, with a few services continuing on to Butterworth, stopping at Bukit Tengah along the way. With Bukit Mertajam being the main interchange station on the Kumuter Utara route, you can easily travel from Simpang Ampat to stations further north in Kedah and Perlis. First take a train to BM, then change there for the Butterworth to Padang Besar Komuter Line. Butterworth, Bukit Tengah, Tasek Gelugor, Sg. Petani, Gurun, Kobah, Alor Setar, Anak Bukit, Kodiang, Arau, Bukit Ketri and Padang Besar (the Malaysia / Thailand border station). From Padang Besar you can then travel by Shuttle Train to Hat Yai Junction station or connect to the International Express to Bangkok. Currently none of the long distance Electric Train Services stops at Simpang Ampat, so you will first have to take a commuter services to the nearby station of Parit Buntar (just two stops) if heading south to places like Ipoh or KL Sentral in Kuala Lumpur. If heading north, it is easier and much cheaper to stick with the Komuter services. Travelling by train from Simpang Ampat you can only buy tickets for KTM Komuter services on the day of travel with no advance booking available or required. 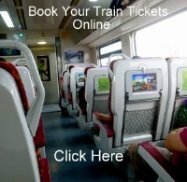 If you want to connect to the ETS services, you would be wise to book your tickets in advance.